All transactions are safe and secure with a reliable history in online purchasing behind each of our associates. Buy the Hoyt for Sheriff t-shirt to own Texas Chainsaw Massacre clothing and merchandise. Cast your vote for the Sheriff of Travis County, Texas in this Hoyt for Sheriff tee. The front of this Texas Chainsaw Massacre tee features a distressed silhouette of the "sheriff", a man who turned his family, including Leatherface, on to the taste of human flesh after having to survive on it as a prisoner during the Korean War. Wear this TCM shirt as part of your Leatherface costume to show your support for the stepuncle, who murdered the local sheriff and now poses in his place. Add Texas Chainsaw Massacre masks below to complete the look. 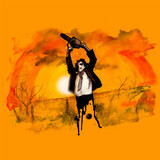 In addition to the Hoyt for Sheriff tee above, browse the Texas Chainsaw Massacre Clothing Gallery for more apparel like men's and women's clothes, kids shirts or hoodies.